Countries are announcing plans to phase out petrol and diesel cars. Is yours on the list? The UK and France are some of the countries planning to ban sales of petrol and diesel cars. China is considering when to ban the production and sale of petrol and diesel cars. The move is aimed at helping the world's largest car producer and seller to tackle air pollution and boost development of electric and hybrid plug-in vehicles. In a statement released through China’s official news agency, Xinhua, the government said that while no date had been set, it was performing “relevant research” in order to come up with a “timeline”. The news comes hot on the heels of the Scottish government’s announcement that it plans to phase out petrol and diesel cars by 2032. Here are some of the other countries that are gearing up to replace fossil-fuel powered cars. In July, the UK government unveiled plans to halt the production of new petrol and diesel cars from 2040. Michael Gove, the Environment Secretary, warned at the time that Britain "can't carry on" with petrol and diesel cars because of the damage that they cause to people's health and the planet. However, experts warn that the national grid will struggle to provide enough electricity to cope with peak demand for charging electric vehicles, for example after rush hour. Air pollution has been linked to 40,000 early deaths a year in the UK. And according to the UN, the country isn’t doing enough about it. The agency recently accused the UK government of flouting its duty to protect citizens from toxic air pollution. France has also said it will ban sales of petrol and diesel cars by 2040. It’s part of a wide-ranging series of measures that the government hopes will position the country as a green leader. Initiatives include the ban on further licences being granted for oil and gas exploitation in France and its overseas territories. Last year, it was widely reported that Norway was planning to phase out diesel and petrol cars by 2025. However, the reports were challenged as misleading. Although the news was enthusiastically received by the CEO of Tesla, Elon Musk, Norway's Minister of Climate and Environment explained that it was more of a policy than an outright ban. Norway already has the highest per capita number of all-electric cars in the world. The Netherlands wants all new cars to be emissions free by 2030 - effectively banning petrol and diesel sales. The country has the highest number of charging points per capita in the world, and the second largest concentration of electric vehicles in Europe. It aims to have 200,000 electric vehicles on the road by 2020, and for 10% of new sold vehicles to be electric. Will this breakthrough see an electric car in every driveway? Which countries are speeding ahead with electric cars? Electric cars are coming. But are cities ready for them? Last year Germany’s Bundesrat passed a resolution to ban the internal combustion engine starting in 2030. Though not legally binding, it's seen as a major step forward in the fight against emissions. Germany already had a target of putting 1 million electric vehicles on the road by 2020, although Chancellor Merkel recently admitted that they may fall short of this target. However, last month, Merkel hinted that it's only a matter of time before Germany follows France, Britain, India and other countries in banning sales of new cars fitted only with petrol or diesel engines. The Indian government has announced that it wants to sell only electric cars within the next 13 years. India is facing an air pollution crisis that is responsible for 1.2 million deaths per year and costing the economy an estimated 3% of GDP. It’s been calculated that the gradual switch to electric vehicles (EVs) across India would decrease emissions by 37% by 2030. According to the International Energy Agency, Austria, Denmark, Ireland, Japan, Portugal, Korea and Spain have set official targets for electric car sales. The US doesn't have a federal policy, but at least eight states have set out goals, says the IEA. The Chinese government predicted “turbulent times” for domestic carmakers forced to adapt to its new targets. And it seems that the global auto industry is also worried. US, European, Japanese and Korean carmakers recently sent a joint letter urging China to delay and soften planned quotas for sales of electric and hybrid cars, saying its proposals will be impossible to meet and would severely disrupt their businesses. That said, some carmakers are embracing the rush to EVs. In July, Volvo announced that every model it launches from 2019 will have an electric motor. BMW has followed suit, saying that all brands and model series can be electrified, with a full electric or plug-in hybrid drivetrain being offered in addition to the combustion engine. Several other carmakers have also announced plans to ramp up their electric car production. The impact on oil companies is expected to be huge, with some arguing that a focus by policymakers on electric vehicles risked diverting investment from efforts to make internal combustion engines more efficient, which they say has more potential to reduce emissions and oil demand sooner. 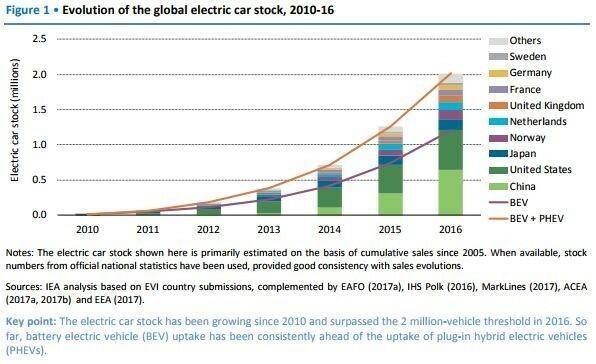 The IEA predicts that, with all the government policies in place, electric car stock may range between 9 and 20 million by 2020 and between 40 and 70 million by 2025.